Political acceptability is the biggest challenge to implementing ambitious carbon pricing schemes. This column argues that behavioural economics and political science provide new insights into the acceptability of carbon pricing which suggest that successful reforms are more likely when the revenues are recycled through lump-sum dividends to citizens. There is no ‘one size fits all’ solution, however, and revenue recycling strategies should account for different social and political contexts and will most likely be mixed in real-world carbon pricing schemes. Carbon pricing is widely understood to be an indispensable tool for meeting the goals of the Paris Agreement to mitigate climate change. Success stories like that of Sweden, which currently has the highest carbon price in the world at US$139 (World Bank 2018), demonstrate that it is indeed possible to make carbon pricing work. While the Swedish economy grew by 60% since the introduction of the Swedish carbon tax in 1991, carbon emissions decreased by 25% (World Bank 2016). However, less than 20% of current global greenhouse gas emissions are covered by a carbon price, and most prices are below the $40-80 per tonne of CO2 (tCO2) range necessary to achieve the goals pledged under the Paris Agreement (Stiglitz and Stern 2017). How can more ambitious carbon pricing policies be introduced? First of all, we need to realise that garnering greater political acceptability is the primary challenge for policymakers. 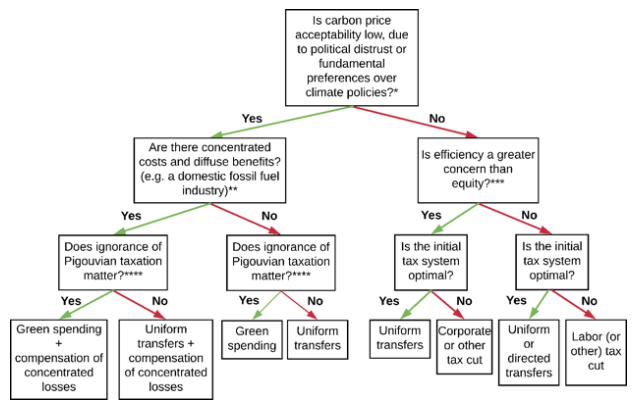 Most economic advice on the design of carbon pricing reforms focuses on questions of efficiency and equity: How might the policy affect GDP growth? What are the policy's projected distributional effects? Of course, efficiency and distributional impacts are crucial determinants of public acceptability. However, traditional economic lessons are of little importance if the carbon pricing reform cannot be implemented for political reasons. In a new article (Klenert et al. 2018), we suggest how the design of carbon pricing reforms could be tweaked to enhance their acceptability to the general public, building on recent insights from behavioural and political sciences, which go beyond traditional lessons on equity and efficiency. Global carbon pricing revenues are already substantial, at $33 billion in 2017 (World Bank 2018), and are likely to increase in the future. How they are used thus plays a major role in the public perception of carbon pricing. Lessons from behavioural economics and political science point to ways of recycling carbon pricing revenues that enhance political acceptability to citizens. Factors related to public perception, such as the salience of benefits, cultural world views or general trust in politicians, help explain why some carbon pricing schemes are currently (un)popular and contribute to ideas on how carbon pricing could be made more attractive to the public. Note: All carbon prices are for 2016, except for Australia's data, which is for 2012. What makes carbon pricing (un)popular? First, the willingness to pay for climate change mitigation is largely a function of political, economic, and cultural world views. Triggering ‘solution aversion’ – the tendency for citizens to be more sceptical of environmental problems if the policy solution challenges or contradicts underlying ideological predispositions – has to be avoided. Second, citizens tend to ignore or doubt the corrective (‘Pigouvian’) effect of carbon pricing, but may be mollified if revenue is earmarked for a specific purpose such as green spending or transfers to disadvantaged households. Third, the labelling of the carbon price may alter perceptions of its desirability. Something as plain as re-labelling a carbon price as a ‘CO2levy’, as done in Switzerland and Alberta, or speaking of ‘fee and dividend’, could circumvent solution aversion and make the measure more acceptable to citizens. Fourth, increasing the salience of the benefits derived from a carbon-pricing reform enhances acceptability, so that visible revenue recycling may be advisable. Some recycling methods, such as transfers to households or public investment, might be more visible to the public than tax cuts, for instance. Political science yields two main insights regarding carbon pricing. 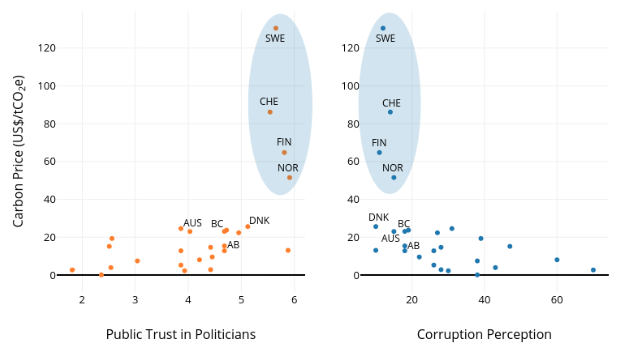 First, ambitious carbon pricingis often correlated with high political trust and low corruption levels (see Figure 1). Cross-national studies indicate that countries with greater public distrust of politicians and perceived corruption persistently have weaker climate policies and higher greenhouse gas emissions (Baranzini et al. 2014, Rafaty 2018). This is exemplified by Finland, Norway, Sweden and Switzerland, which all exhibit high levels of trust and have carbon prices above $40/tCO2. If trust is low, revenue should thus be recycled using a transparent, trust-boosting strategy to enhance its acceptability. Second, a policy reform is more likely to be successful if its costs are diffused and the benefits are concentrated. The challenge with carbon pricing is that it tends to have diffuse benefits and concentrated costs, such that the scattered beneficiaries of the policy are less likely to support it in the political process than carbon-intensive companies are to oppose it. Success may be more likely if the benefits of carbon pricing reform are concentrated on constituencies who will actively support the policy’s passage and preservation. Additionally, carbon pricing schemes are more likely to survive successive partisan changes in government if they benefit constituencies across the political spectrum. 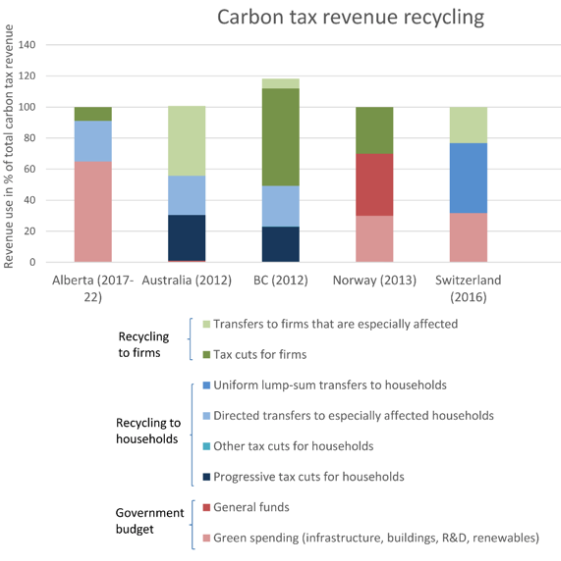 Apart from careful labelling, making sure that the benefits are salient, avoiding solution-aversion and ensuring transparency and clear communication, the acceptability of a carbon tax reform can be enhanced by adapting the revenue recycling strategy to the socioeconomic context (see Figure 2). While recycling revenue as lump-sum dividends addresses most behavioural and political constraints on carbon pricing, other recycling methods such as green spending, targeted transfers or tax cuts can be more appropriate. If citizens question the mitigation impact of Pigouvian pricing, for example, increasing green spending might convince them of the policy reform. Earmarking the revenue to address specific salient problems such as underfunded pension schemes or crumbling infrastructure could also enhance the acceptability of a carbon pricing reform. Inequality concerns should be addressed by directed or lump-sum transfers, which would predominantly benefit poor households as they receive more in transfers than they spend on carbon taxes. If efficiency is a major concern, using the revenue to reduce other distortionary taxes is the preferred option. Budget-neutral strategies such as uniform transfers or tax cuts are more appropriate in contexts of prevalent centre-right world views, low-trust governments and tax aversion. Notes: *Lessons regarding political trust and political, economic and cultural world views apply; **lessons regarding the salience of revenue recycling and the creation of politically powerful beneficiaries apply; ***from here on and below traditional public economics lessons apply; ****lessons on citizens' ignorance of the corrective (‘Pigouvian’) effect of carbon pricing apply. In reality we observe mixed recycling strategies (see Figure 3 for an overview of recycling strategies in different carbon tax schemes). However, successful carbon pricing initiatives have designed their revenue recycling in accordance with at least some of the presented political and behavioural effects. The success story of Sweden’s world-leading carbon tax may partly be owed to extensive public dialogue and social deliberation which may have reinforced political trust and transparency prior to the fiscal reform that introduced carbon taxation. The revenues of Alberta’s successful ‘carbon levy’ are split between green spending and compensation for those who are disproportionately affected by carbon pricing, thereby illustrating lessons on labelling and the ignorance of Pigouvian pricing. British Columbia, where all carbon tax revenues go to households and firms, has created strong constituencies in favour of carbon pricing. Backed by both an environmentally aware electorate base and the business community, the centre-right government was able to design a carbon tax reform that enjoys broad political acceptance. The Australian carbon pricing scheme provides a cautionary tale. Introduced in 2012, the recycling strategy was designed ‘by the book’, taking into account insights on equity and efficiency. However, the carbon price was abolished in 2014, demonstrating that a carbon price design that meets equity and efficiency goals alone is not sufficient, while politics and political communication are of crucial importance. Note: The spending in British Columbia exceeds 100% since the region committed to additional spending. In light of the current carbon pricing gap, economic lessons on efficiency and equity are subsidiary to the primary challenge of garnering greater political acceptability. Designing revenue recycling mechanisms with an eye on political and behavioural insights and in accordance with the socioeconomic context can help make carbon pricing work for citizens and thus a political success. Baranzini, A, M Caliskan and S Carattini (2014), “Economic Prescriptions and Public Responses to Climate Policy”. Klenert, D, L Mattauch, E Combet, O Edenhofer, C Hepburn, R Rafaty and N Stern (2018), “Making Carbon Pricing Work for Citizens”, Nature Climate Change 8(8). Rafaty, R (2018), “Perceptions of Corruption, Political Distrust, and the Weakening of Climate Policy”, Global Environmental Politics (Ahead of Print). Stiglitz, J E and N Stern (2017), Report of the High-Level Commission on Carbon Prices. World Bank (2016), “When It Comes to Emissions, Sweden Has Its Cake and Eats It Too”, 16 May. World Bank (2018), States and Trends of Carbon Pricing 2018.